First minted in 1967, the South African gold Krugerrand coin was an attempt to help market South African gold produced by the country’s mint. It eventually accounted for 90% of the global gold coin market by 1980, despite its association with the apartheid movement, which caused numerous countries to reject its use. After discovering an expansive resource of gold in the 1960s, South Africa quickly and ambitiously entered the gold market in the hopes of advertising South African gold to the world. Although the purchase of gold ingots for private ownership was illegal at the time, the government sold its gold in the form of collectible currency, the Krugerrand, at a cost of five per cent over the spot price. 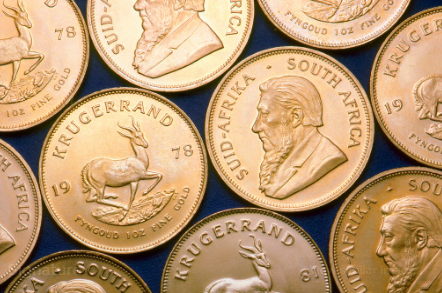 In its original form, the Krugerrand contained one troy ounce of 22 karat gold. Thereafter, additional coin styles were minted, including a ½ ounce, ¼ ounce and 1/10 ounce released in 1980. Paul Kruger, State President of the Republic of South Africa was featured on the face of the coin. Fast-forward and the Krugerrand is regarded as an integral facet of gold and economic history. Jewelry ‘N Loan in Orange County, California both purchases and provides pawn loans against precious metals, specifically gold and platinum. Not only do they buy, sell and loan against gold and platinum jewelry and fine watches, but they also deal in gold and platinum bullion and coins. Please call us at 949.645.0488 for more information. Article about the South African gold Krugerrand coin. The interesting history and development of how South Africa entered the gold market. Brought to you by Jewelry-N-Loan.